This is a continued exploration of Microsoft’s aggressive (if not corrupt) fight for hypervisor control [1, 2]. 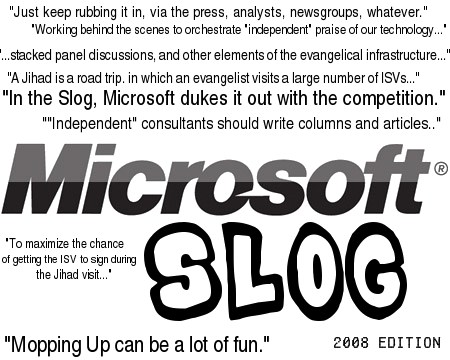 Microsoft refers to such things as "Slog" or "Jihad" and today we’ll show that the usual suspects are personally involved in seizing the foundations of many servers. As pointed out in the news [1, 2] (scroll down to the very bottom), virtualisation in growing more important in the back rooms. Even Red Hat insists so. According to this article from IDG — an article about Microsoft and Novell grouping together against everybody else — it is indeed something whose potential has yet to be fully exploited. At a virtualization launch event Sept. 8, Bob Muglia, senior vice president of Microsoft’s server and tools business, said, “It is still early days. Only about 12% of servers are virtualized.” He also said that Microsoft foresees a future world where virtualization is the norm: “It will be used across all the servers and desktops in a business,” he said. Microsoft must view this as an opportunity to shut out rivals. DRM and the MBR are other such opportunities that Microsoft misses or is unable to over-abuse due to regulation. Instead, in this particular case, it’s rallying for partners. Novell’s new pet, rPath, is also getting close to Microsoft while Microsoft’s ‘analyst’ allies [1, 2, 3] speak of the potential. Leading analyst firm Gartner predicts virtualization will be the highest-impact trend changing IT infrastructure and operations through 2012. A virtual appliance is an application combined with just enough operating system (JeOS) for it to run optimally in any virtualized environment. In addition to the Windows platform, rPath supports all the major virtualization platforms including VMware, Citrix Systems, Parallels and Virtual Iron. The most appalling thing which happens at the moment isn’t to be attributed to IDG (IDC being another party which is sponsored by Microsoft) or even Gartner. It’s actually Microsoft’s talking point and long-time poison pen, Maureen O’Gara. She’s attacking VMware insanely while defending Microsoft and Novell, as usual. Here is some proof [1, 2] showing she is a shill for Microsoft. She got caught, so it’s no matter of speculation and she has already tried relentlessly to attack Linux using SCO. “I notice she upgraded her picture recently, she appears to be growing younger,” says one anonymous reader. In a previous post about this slog against VMware we have already criticised Sys-con for excessive FUD, such as premature predictions of death. This slog against VMware was mentioned in the IRC channel as well. Such enormous amount of anti-VMware poison in Sys-con is intended to erode customer confidence and infect the minds of other journalists, who peer through their news feeds. Sys-con: Will VMware Still Exist in Five Years? Here is a new Microsoft virtualisation praise from Sys-con. Must be a coincidence, right? Not quite as bad as InternetNews with “Microsoft Charges Ahead in Virtualization”. It’s all about those headlines and the Microsoft-friendly ZDNet is one of the worst in that regard. Larry Dignan proves it with “Microsoft Hyper-V to VMware: We have you surrounded”. If the argument is repeated often enough, it’s hard not to believe it. Microsoft knows it is well behind in this game, especially based on technical merit. In reality, it’s just more bad news for Microsoft with the following new setback. The delay means the software giant — which is striving to win favor for its virtualization solution — still lacks features long available from rivals. It has been just vapourware or wishful thinking all along. Having already postponed this product’s release and castrated promised features from it, they pretended to have made it available “ahead of schedule”. A more moderate headline actually came from Forbes, for a change. Going back to Sys-con, it’s O’Gara who is welcoming Novell to Microsoft’s virtualisation table (because they use Hyper-V, of course). Could the bias or agenda be any clearer? Microsoft ‘talking point’ Ina Fried, whose latest FUD against GNU/Linux we mentioned quite recently [1, 2, 3], is also propping up this treasonous relationship between Microsoft and Novell. The pair announced that they will jointly support a virtualization scenario in which Suse Linux is running as a guest operating system under Microsoft’s Hyper-V virtualization. There’s also involvement in this article. Colin Barker reported on Citrix and Microsoft ZDNet.co.uk, while Tim Ferguson reported on Sun Microsystems for Silicon.com. Ina Fried reported for News.com about Microsoft’s arrangement with Novell. Microsoft’s collaboration with Novell is also associated with intellectual property assurances. Those assurances are highly controversial in the open source Linux world. Microsoft essentially promises not to sue companies for patent violations when they buy Novell’s Linux through Microsoft’s certificate program. There’s more about it in the Indian press. Once again, criticism is missing. Microsoft Corp. and Novell Inc. are announcing the availability of a joint virtualisation solution optimised for customers running mixed-source environments. Novell Inc. and Microsoft Corp. announced Thursday that they have developed technology that allows businesses to run Waltham, Mass.-based Novell’s open-source operating system on Microsoft servers. Evidencing the ongoing collaboration between two formerly bitter rivals, Microsoft and Novell on Tuesday announced a joint virtualization solution optimized for customers running mixed-source environments. This also appeared in CIO Today. Novell may be suing Microsoft for allegedly conspiring to kill WordPerfect, but that’s not stopping the companies from joining forces on other fronts. Meanwhile, Novell’s antitrust suit against Microsoft is proceeding. Novell accuses Microsoft of using monopolistic tactics to drive WordPerfect and Quattro out of the market. Earlier this year, the U.S. Supreme Court gave Novell the go ahead to continue the litigation. Sys-con reckons that Microsoft might buy Novell because of this lawsuit. Did Microsoft tell them something again? Yesterday or the day before that Sys-con wonodered whether Microsoft will buy Citrix, suggesting that it’s possible. However unlikely, according to Microsoft insiders, Forbes speculates that Microsoft might eventually buy Citrix, which currently has a market cap of $6.4 billion. That would give Microsoft full ownership of Xen, which it already pretty much controls by proxy [1, 2, 3, 4, 5, 6, 7, 8, 9]. Citrix and Microsoft are still getting closer, as just reported by ZDNet. Vnunet.com was wrongly spinning the deal with Microsoft as “acceptance” rather than a betrayal or intrusion. The deal also marks the latest chapter in the ongoing partnership between Microsoft and Novell. The two first joined forces with a licensing deal in 2006 that many viewed as Microsoft’s official acceptance of Linux. Last month, the two reaffirmed that partnership when Microsoft agreed to spend another $100m on new SUSE licences. Microsoft said that the new deal represents significant progress in the partnership. Pete Judge falters on some points, but he does at least emphasise that Microsoft only supports SUSE and that it indicates deficiencies exist. Microsoft and Novell have announced that Novell’s Suse Linux will be supported as a guest under Microsoft’s Hyper-V virtualisation product. However, some Linux users have said the deal only demonstrates the limited value of Microsoft’s virtualisation offering. Microsoft wants to control the ‘pipes’, deciding which software or operating system can run on top of Windows (and how well). Badly-performant GNU/Linux distributions and patent tax are key and here is a good new explanation of why that is. When Microsoft finally released its long-awaited hypervisor technology, Hyper-V, it also announced a partnership agreement with Novell to offer support for Novell SUSE Enterprise Linux in the new server virtualization platform. However, for the Linux guest operating system to perform at its best, it needs additional components that Microsoft calls Linux Integration Components. At the end of the day, there will always be many Microsoft voices drowning out the ‘signal’. This includes ‘analysts’ like Yankee Group and Burton Group, who repeatedly sling mud at VMware [1, 2, 3. Both analysts have accepted Microsoft money (or favours) to produce a series of ‘studies’ which defame Microsoft’s rivals using selective statistics and other such trickery. It’s only rather disappointing that the Linux Foundation funded those very same people at one stage, essentially feeding the same poison pen that stings them. They must not fight fire with fire because this leads to hypocrisy. They needn’t pay attention to that fire, either. Sadly for VMware, it does not equate or top Microsoft in terms of bad behaviour. And nice guys sometimes finish last. Center of attention was Qumranet, the firm Red Hat agreed to acquire just last week for about US$107m. Best known for its KVM virtualization software, Red Hat sees the addition of the Qumranet technology helping to take it up against Microsoft — the other company owning both operating system and virtualization components. Do two technology trends, the rise of server virtualization and the advance of cloud computing, go together like peanut-butter and jelly, or more like tunafish and pistachio nuts? It depends on who you ask, but in general, virtualization is seen as complementary to cloud computing but not a necessity.